The classic Little Black Dress that shouts out Posh Spice from her 90s music days. Add the specific Posh character wig to complete the perfect look. A silver microphone to complete your rock star look. Grace bob in black. A very sleek look for 1920s. 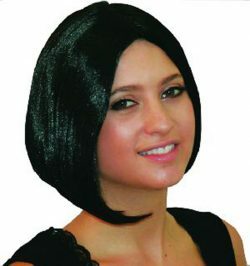 Black Paige bob shaped wig. Costume eyelashes that can be reused with careful handling and storage after use. Tube of application glue included. These eyelashes are great for many characters from Chicago to Priscilla.